Sharing the gospel with our children is the most important thing we could ever teach them. We need to be sowing seeds of faith into their lives every day. The best way we can do that is doing it in ways that children connect with the most – and one of the biggest is their play. 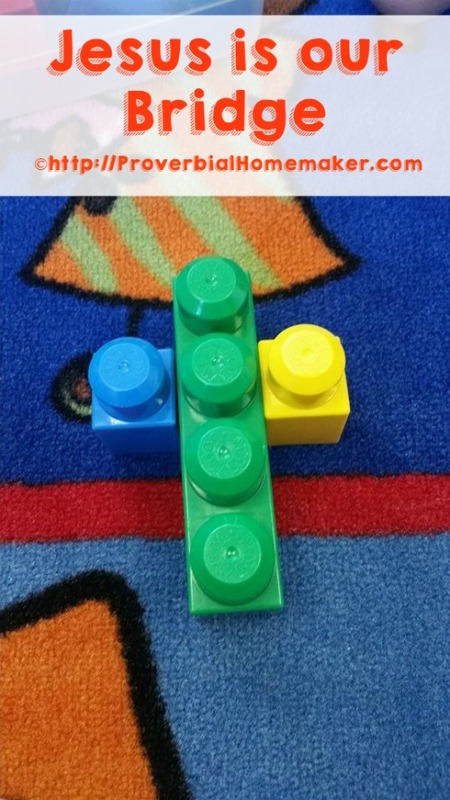 If you have a child in your house, you are sure to have legos. 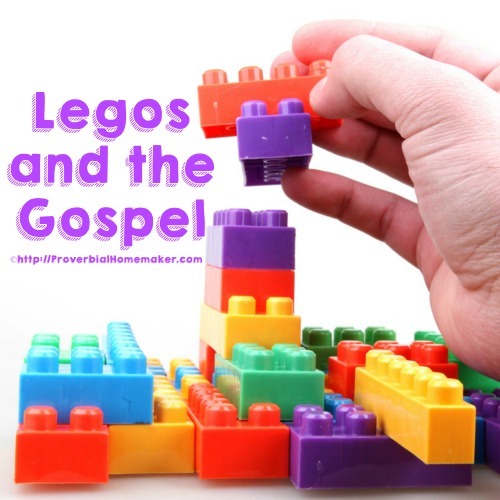 If you have legos- then you have a tool to start sowing seeds of the gospel into your children. Red is the color of my favorite rose, green is the color of the grass that grows. 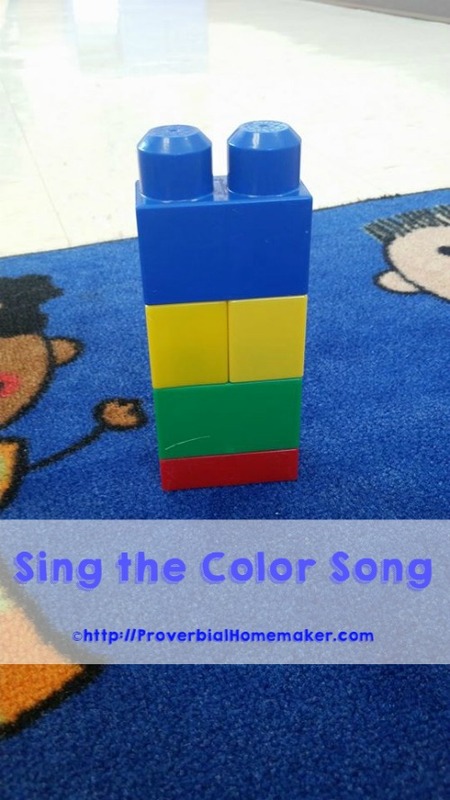 Yellow is the color of the sun that shines, way up high in the blue, blue sky! Jesus, you sure know how to color. Jesus, you sure know how to color, Jesus, you sure know how to color – color my heart with love. The next thing I do as my children get over is I talk to them about sin. Yes, we must tell our children that they are sinners. That they do wrong. It is important that we do this- otherwise, they won’t know their need for a savior. I use the block as a visual as we talk about this. First, I tell them that sin separates us from God. Then, I tell them that God loves us, and so He sent Jesus. Jesus lived a perfect life – and than willingly gave that life for us on the cross. On the third day, He rose again – making a bridge for us to get to heaven. 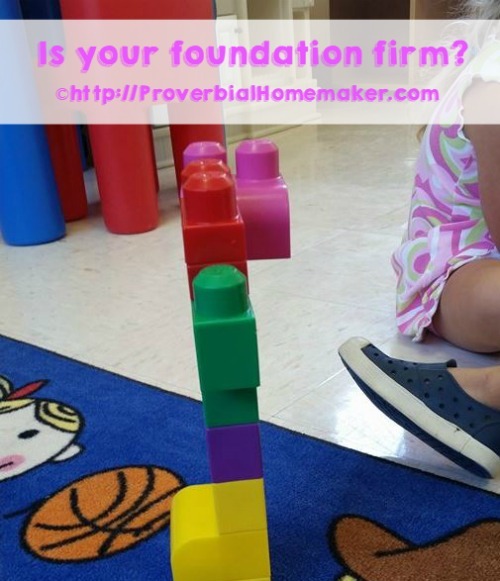 The last thing I like to use legos for in Bible time with my kids is to teach them about the firm foundation. When we surrender our lives to Christ, He is our foundation. Before Him, our lives are not on the firm foundation. I place a block that does not have knobs on both sides, and I begin to build. I then have the children drive cars or play around it. It will soon fall over, because I have built on a foundation that isn’t stable. 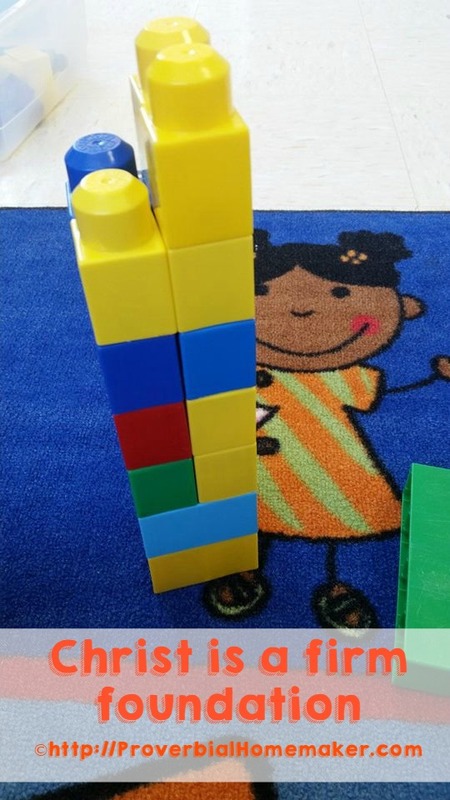 Then, I build a tower with a firm foundation – all 4 knobs on the bottom. We play around the tower- and see that it is harder to shake it. The tower has a firm foundation. This is how our life is when have Christ as the foundation. Salvation is so important- and so it is imperative that we teach our children about it. 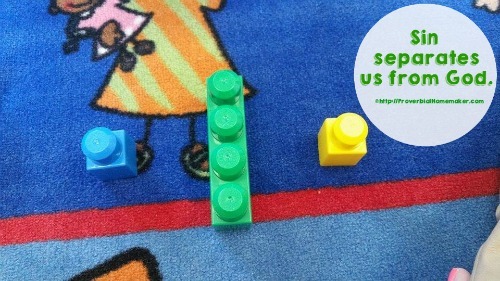 We can do that through ways that they can understand, touch and play with. By doing this, we are relating the gospel, and its beautiful message and placing seeds in their hearts. 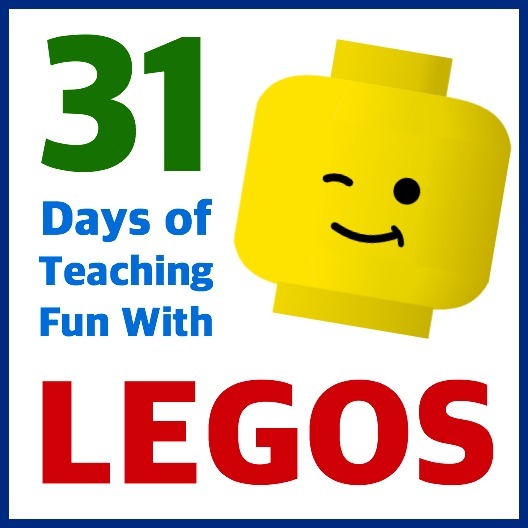 This post is a part of the 31 Days of Teaching Fun With Legos here at Proverbial Homemaker! Check out all the other great posts in the series! What a great illustration for the littles! Neat ideas – thanks for posting! Gonna pin this one to my Homeschool – Bible board for later reference.